When we arrived at the arena tonight, a large group of Bernie supporters were protesting just outside the entrance. We learned that 120 Bernie delegates had walked out after the Roll Call vote. Jon interviewed one of these delegates, Carmen Hulbert, from Red Hook, Brooklyn. A Peruvian immigrant, she is the co-founder of Latinos for Bernie, NY, and has worked in the trenches for Bernie for over a year. When she was elected a National Delegate for the 7th Congressional District in Brooklyn, she mounted a GoFundMe campaign to raise the money for her travel to Philadelphia for the convention – www.gofundme.com/CarmenHulbert. A long double row of police officers had set up inside, to contain a growing number of angry Bernie supporters as they walked out, as if to protect the rest of the delegates from contamination. In addition to the three extraordinary women [videos on Power2016.net] we spoke outside the Muslim American Host Committee Welcome Lunch (did you know that Philadelphia is known as “Muslim Town?”), this moment with Carmen Hulbert brought all the hoopla of the conventions down to ground, to the individuals whose lives are profoundly affected by what goes on here. Inside the hall, the litany against Trump and for Hillary continued. The Mothers of the Movement, comprising the mothers of Trayvon Martin, Jordan Davis, and Sandra Bland, appeared, speaking with force and clarity about their reluctant membership in this movement when their children were killed. Sen. Amy Klobuchar of Minnesota introduced Ima Matul, from Indonesia, who had been commandeered into sexual slavery. Cecile Richards, President of Planned Parenthood, spoke about the real and present danger of returning to the time before Roe v. Wade. The underlying theme tonight, building on Michelle Obama’s speech last night, was the importance of this election for children, who cannot vote. But the real star tonight was Bill Clinton. When he came out on stage and did a little dance skip step just before reaching the podium, the crowd erupted. When they finally quieted down, he began with the line, “In the spring of 1971, I met a girl.” As he told the story of his courtship of and marriage to Hillary Rodham Clinton, the whole arena changed. This massive space, filled to the brim with 25,000 excited activists, suddenly became Bill’s living room. The temperature changed. Bill Clinton broke the Machine. Bill Clinton talked about Hillary like previous First Ladies have talked about their husbands. It was a trans-gender speech, and he pulled it off beautifully. This is a man who always knows exactly who his intended audience is, and tonight it was married women, especially suburban married white women, the group that Hillary needs to win and win big. He called Hillary “The best darn change-maker I’ve ever met in my entire life.” He compared her to Bobby Kennedy. He rubbed off all the hard edges of Hillary and made her into what everyone hoped she would be, and we believed him. We wanted to believe him. Her biggest problems right now are Trust and Likeability, and Bill moved the needle. He said the Republicans couldn’t run against the real Hillary, so they’ve created a different one, a cardboard cutout image. He said it came down to this: “One of them is Real, and one is Made Up. Luckily, you’ve nominated the Real One.” It was the most astonishing bit of sleight-of-hand I’ve seen in years. I don’t like Bill Clinton; I never have. I still blame him for moving the Democratic Party to the center-right during his Presidency—of giving up too much to stay in power when I didn’t think he needed to. But tonight I have to say it was a pleasure to watch a real pro work. He loves speaking and connecting with an audience, and they love him back. He told a compelling, believable story and created a different image of Hillary. 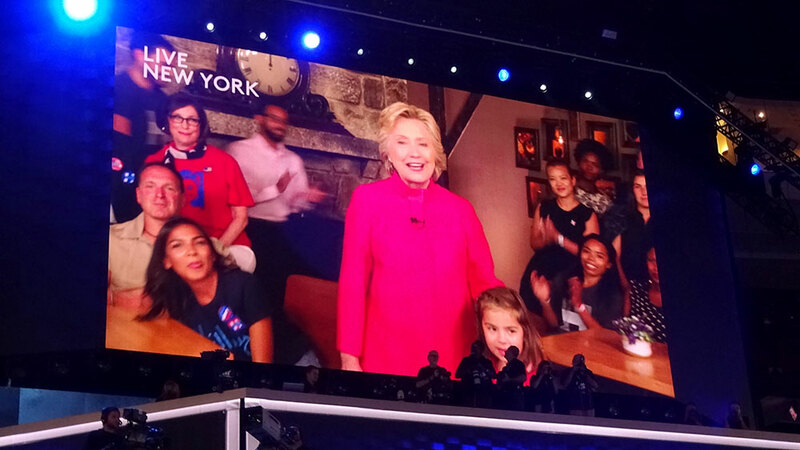 Unfortunately, at the end of the night, Hillary appeared on the giant screen, “Live from New York City,” and spoiled the image that Bill had so masterfully created. She appeared wooden and awkward, even as she received the tumultuous applause. Because she apparently couldn’t hear the applause and screams of the crowd in the arena, she didn’t respond to them, and her timing was all off. Once again, she seemed distant and aloof, even while surrounded by laughing girls and women. If only this change-maker could somehow change her own image.